"Derecho" -- it's a word indelibly marked in the memory of anyone who was living in the D.C. area on June 29, 2012. That was the night an incredibly violent line of storms ripped through the area without warning. The storm arrived with violent wind gusts that yanked out trees from their roots and furious lightning that flashed constantly for more than 15 minutes. The derecho killed at least 13 people, led to a failure of Fairfax County's 911 system, and left thousands without power during the record-breaking heatwave that followed. "[The w]ind was howling so loud and hard that our wall-sized windows were flexing in with each gust!" recalled Peter Laager. He said when the lightning begin, he actually took a sigh of relief because it meant the wind had died down. Tracee Wilkins reports how neighbors are helping neighbors who are left in the dark and no air condition. A derecho is a severe band of storms that can have the intensity of a hurricane. But instead of moving in a rotation, the storm moves in a solid line. A derecho's wind gusts can reach 60 mph and spread damage as far as 250 miles. Storm Team 4 said the region gets a derecho about every four years, but 2012's was so intense that it was categorized as a once-in-30-years event. In the aftermath of the storm, residents sweltered through triple-digit heat and threw out rotting food, cleared branches and debris from their yards -- and had plenty of stories to tell. A massive tree fell on Lynne Therrien's home, crashing through the roof and damaging the bathroom next to where she was sleeping. And a neighbor's tree that split fell onto her fence and deck, damaging much of her backyard landscaping as well. But Therrien said they were lucky. "We were blessed... not a scratch on us, our granddaughter or our family dog," she said. Local businesses with power became hubs of activity as people clambered inside for air conditioning and access to power outlets to charge their phones. "Montgomery Mall [turned] into an air conditioned refuge," Ira Miller recalled as the first anniversary of the deadly storms arrived. "...[P]eople [were] hoarding electrical outlets wherever they could find them to charge all of their various devices." D.C. resident Carolina Alcalde saw her life change forever that night. She was paralyzed when a tree fell, crushing her as she rode her motorcycle up 16th Street after the storm suddenly rolled in. "I wasn't being careless on my motorcycle," Alcalde told News4's Erika Gonzalez in 2013, after a year of intensive recovery. "I was just going home." Alcalde and her network of friendly and family continue to post updates on Facebook about her life, and share advice for others living with paraplegia. While she is still dealing with pain from nerve damage, she is now able to stand for up to three hours at a time in a standing frame, and posted that she's looking forward to doing more travelling on her own soon. Alcalde also wrote in a recent Facebook post that she loves to drive her car. "I love that no one knows I'm in a chair when I'm behind the wheel," she wrote. "It feels great and empowering to leave some people watching with gaping mouths, when they see me get into the driver's seat from my wheelchair." 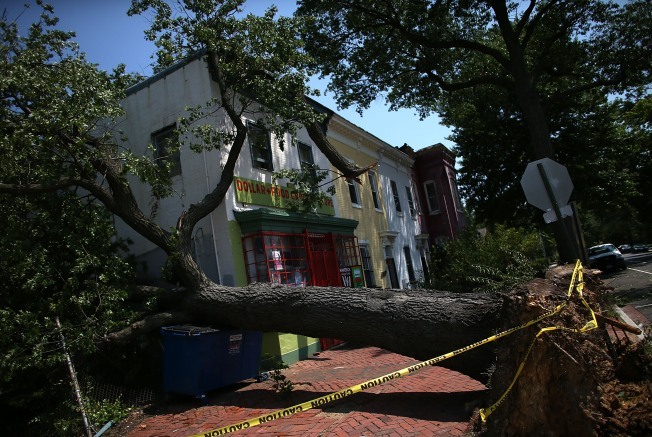 In the wake of the violent storm, Pepco came under fire for lengthy power outages. Since then, the utility installed new poles, trimmed trees and improved both underground and overhead power lines. Verizon and emergency officials worked to improve Fairfax County's 911 system following its outage after the storm, trying to ensure that the system will be able to withstand another severe weather event. That included making sure that battery backups and generators are working.